The Food and Agriculture Organization has designated four traditional farming systems in Bangladesh and Japan as “Globally Important Agricultural Heritage Systems (GIAHS)”. These include Bangladesh’s floating gardens, a hydroponics production system constructed with grasses and plants developed in flood areas, and three sites in Japan: the sustainable river fisheries utilising the Sato-kawa system in Gifu, the Minabe-Tanabe Ume approach of growing apricots on nutrient-poor slopes in Wakayama and the Takachihogo-Shiibayama mountainous agriculture and forestry system in Miyazaki. The latter allows agricultural and forestry production in a steep mountainous area. All the four sites were officially recognised during a joint meeting of the GIAHS Steering and Scientific Committee in Rome. The new designations bring the number of GIAHS to a total of 36 sites located in 15 countries across Africa, Latin America, Near East and Asia. “In the context of today’s environmental and economic challenges and climate change, small-scale and family farmers, and especially traditional agriculture, can offer real solutions for food security, the conservation of natural resources and sustainable rural development, if adequate policies and investment are directed to them,” FAO Deputy Director-General Maria Helena Semedo said. GIAHS was launched by the FAO in 2002 during the world summit on sustainable development in South Africa. It has been recently endorsed by the member countries. 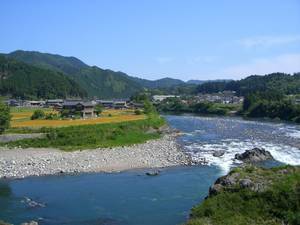 The Nagara is one of the cleanest rivers in Japan that provides a number of ecosystem services. The sustainable inland fisheries of a specific type of fish (Ayu) benefit from the clean water of the river which is maintained through upstream forest management. Local communities have lived in this ecosystem and developed their livelihoods and cultural practices. This system allows for the production of high-quality Japanese apricots and various kinds of fruits on nutrient-deficient slopes. The locals have created a thriving fruit production environment by maintaining upper coppice forests for landslide prevention and maintenance of water and Japanese honeybee for pollinators. The system ensures stable livelihoods and makes communities resilient to disasters. Under this, local people have established a sustainable system of agriculture and forestry which balances timber production with diverse farming activities. The latter includes terraced rice growing, mushroom cultivation, beef cattle raising and tea cultivation. Bangladeshi farmers have developed a unique system in which plants can be grown on the water on a floating organic bed of water hyacinth, algae and other plant residues. This type of cultivation technique utilises the natural resources of wetlands to grow vegetables and other crops almost all year round.